Are you robbing someone of the opportunity to grow? Delegation is one of the toughest things for most people to do. Why, well? I know it will be done my way. I learned a long time ago, as a television producer, is I had to delegate to be effective. It took me a while to learn proper delegation because initially, I had to do everything myself. It was very easy for me to do it my way and make sure it was right and take my time or hurry up, depending on the situation. When I was 1st given an assistant, I actually had one of my colleagues say to me, “you know, if you don’t leave her alone, you’re going to lose her.” I was having a hard time delegating, giving stuff up and I was always checking and looking over his shoulder to make sure she did it my way or correctly. Well, guess what, I knew she was talented. I knew she had lots of skills. I also learned very quickly that my way wasn’t the only way. The hard part is sometimes when they do it their way, it’s better. We like to think ours is the only “right way”. 1. Plan. 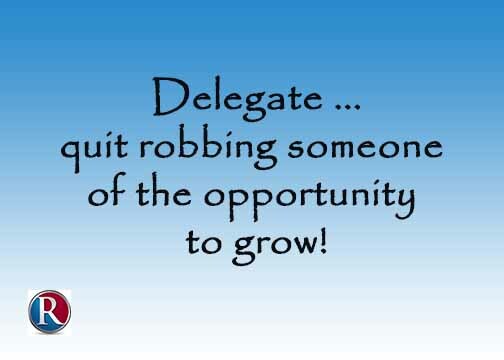 What are you going to delegate? Why are you delegating it? Who are you delegating to and what results do you expect and by when? It’s that old W5 thing. You’ve got to figure out what needs to happen, by when, by who and how are you going to find out of it it’s done to the proper level. 2. Hold people accountable, including yourself. One of the worst things I’ve seen, and I see it continually in companies I work with and with folks I see in my workshops, is nobody’s held accountable. Ah, well they didn’t do it right … well, I’ll let it slide this time. 3. Have the difficult conversations when somebody doesn’t do something correctly. When it comes to delegation … plan … what I’m going to delegate, who am I going to delegate it to, how am I going to delegate it, why am I delegating, what results do I expect? If you plan properly before you ever have that conversation with your individual, you’re going to have it all organized and you will be able to answer questions because questions are there. Remember, if you are communicating with someone, it’s two-way. They must be able to ask you questions. You can’t just walk in and dump something on someone’s lap and walk away. That’s not communication and all you’re doing is setting someone else up for failure. So, plan and have that conversation … make time for the conversation. Is it going to take more time to delegate initially … yes, so get over it. You’ll just have to put up with taking a little more time. Is it going to take some training and coaching … possibly … you’re going to have to do that as well. Build that into your plan so you know that you can help someone else grow, because when you don’t delegate, what you’re doing is robbing someone else of the opportunity to grow. Plus, you’re also ensuring that 6 months from now you’ll have a whole bunch of new things on your plate and all the stuff you didn’t delegate. Add your comments and share how you effectively delegate. Author garthrobertsPosted on October 15, 2018 Categories UncategorizedLeave a comment on Are you robbing someone of the opportunity to grow? It’s IT’s fault. The CEO doesn’t really know what’s happening. That department isn’t doing what they’re supposed to do. Have you ever heard any of these types of comments at your work? Of course, you have. Unfortunately, most of us have uttered those types of comments. They are all part of the blame game. It’s the one game played in all companies too often. Psychologists can give you specific reasons why we play the blame game. At the bottom of this piece is a link to an article in Psychology Today. It gives you five reasons why we play the blame game. In this post, I want to give you three steps to stop the blame game. This sounds simple, but we’ve all grown up in societies where it’s human to blame someone else for your problems. Maybe you blamed a sibling, a classmate, or a workmate. It took the pressure off you for whatever was going wrong. As a leader, the buck stops with you. If there’s a problem, you need to help solve the problem. Passing the problem along means you’re not a leader. Of course, you can’t solve all the problems that come to you, but you certainly can take the lead in finding the solution. One way to stop the blame game is to deal with problems when they arise, even if they aren’t your problems. I once looked after four programs in a department where we had many calls from customers. It was standard procedure for whoever took the call to ensure that we answered the questions, referred the caller to a specific person or department that would have the answer, or took the person’s number so we could call back with the information requested. Yes, it took time, but we satisfied our customers and, in the process, learned more about our organization. By following this procedure, we were proactive, had answers, learned more about our organization, and, in doing so, replaced negativity with positivity. When you have answers, you don’t have to blame anybody else or lack the information you need. Very few people like conflict. Consequently, when someone else makes an error or blames someone else we are reluctant to challenge them. If it’s your peer blaming someone or a direct report, it’s up to you to challenge that person and question why they’re blaming someone. How? Ask good questions. I learned a long time ago that asking good questions can solve many problems. Who, what, why, when, where, and how questions can get you to the bottom of many problems. When someone says that management doesn’t know what they’re doing. Start asking questions. What do you think they should’ve done in this situation? How would they handle this differently? What processes could be put in place to make this better for us? The person who is in the middle of blaming management will have to pause and formulate an answer. Usually, they aren’t going to have an answer. If they don’t get the point that blaming someone else is not helping the problem, you want to take the opportunity to suggest if they don’t have an answer, don’t blame someone else. Many people blame when they don’t have an answer or when their emotions get in the way of their logic. Blaming is a defence mechanism. We don’t want to be wrong. We don’t want to look foolish. If those two reasons, or many others, are what’s keeping the blame game active in your workplace, change the culture. You change the culture by being the problem solver. If you continually demonstrate that it’s okay not to have all the answers. It’s okay to ask for assistance. It’s okay to give credit to someone else for solving a problem. You’ll soon be recognized as a problem solver and how you function will begin to be emulated by others. Stopping the blame game in any situation, be it work, community or family is going to take time. It’s going to take leadership. It means you will hold people accountable to do what they’re supposed to do. It means you will make people responsible for their job or their position in life. Like anything else in leadership, eliminating the blame game in your workplace or in your team takes planning, communication, and follow-up. 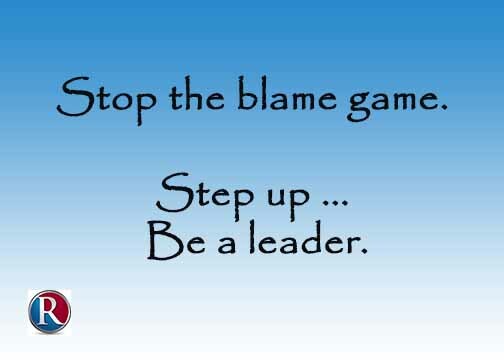 What have you done to stop the blame game? Comment below.